The "Paisley Mod" Leather Dog Collar, a unique high quality full grain leather collars with fashion & flair! Add a flower accessory to give your pup a sophisticated, fashionable look. It's beveled, hand finished edges provide your pet with additional comfort. The Hippy Chic Collar is sure to bring your pet flair and fashion, it's super cute. Made in the USA. Buy online: leather dog collars, designer dog collars, ribbon leather dog collars, handmade designer dog collars from Bookie and Belle Collars USA. * We strive to keep the prices on our website up to date. However, the prices on the actual seller's site is what you'll actually pay. The Paisley Mod Leather Dog Collar, a.k.a. the Hippy Chic. 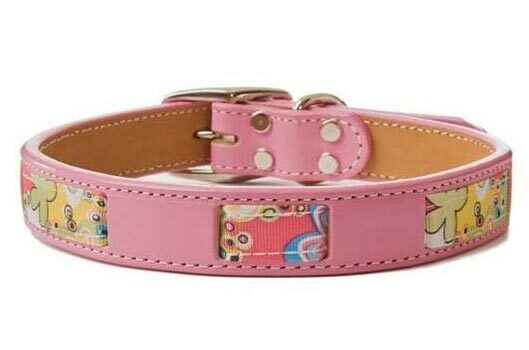 A Super Cute pink leather collar with fashion & flair! Paisley ribbon. Add a flower accessory to give your pup a sophisticated, fashionable look. It's beveled, hand finished edges provide your pet with additional comfort. Designer collar by Bookie and Belle.